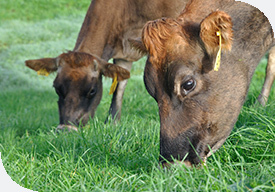 Andrew Dowling on supplementary feed for your livestock over winter. It is essential to keep your animals healthy and strong throughout the year as it enables them to manage stressful times such as winter. One important way of ensuring your animal’s health is by jam packing your animal’s feed full of the right nutrients. In winter grass growth lessens while greater wastage occurs due to muddy conditions. To help get through this period and maintain your stocks body condition it is common to use supplementary feed. The feed that you choose is dependent on the age and type of animals you are feeding. Supplementary feeds generally contain two important nutrients; energy and protein. Protein requirements are much greater in young animals (up to two years old) compared to adults. Animals with twin pregnancies also demand greater protein in their diet. When you are choosing feed for your stock make sure you discuss what feed you have available and what type of animals you have. This way the “gaps” in diet can be identified. The amount of feed required per animal is also dependant on how much is wasted. Feeding onto the ground results in at least 25% being wasted. Hay racks, feeders and troughs that keep feed off the ground help to keep it in a palatable condition, easier to access and less is dropped onto the ground and wasted. For more advice on feeding your livestock, contact 0800 10 22 76 or visit your local PGG Wrightson outlet. A former vet, Andrew Dowling is Technical Manager – Animal Production in PGG Wrightson’s Rural Supplies Technical Team.